George Kaumuali’i – Humehume worked as young teen in Fitchburg, Mass. George Kaumuali‘i – Humehume as drawn by Samuel F. B. Morse prior to departure for Hawai‘i aboard Brig Thaddeus. In searching for information on the life of pioneer Sandwich Islands Missionary Asa Thurston I came across new details on the life of George Kaumuali‘i-Humehume, the Prince of Kaua‘i, son of King Kaumuali‘i. Most accounts of Humehume’s life in New England skip from his being sent aboard the American merchant ship Hazard to Boston by his father at the age of four. The cargo of sandalwood given to Captain Rowan of the Hazard was to pay for his education. Instead, the funds ran out early in his life in the Worcester, Massachusetts region. Usually an account will mention he worked as a carpenter’s helper, and as a hand on a farm, but little else. These new insights into Humehume’s difficult years in New England were documented in about 1885. An elderly man who as a child knew Humehume well, asked to be heard during a talk before the Fitchburg Historical Society in Fitchburg, Massachusetts on the life of Sandwich Islands Mission missionary Asa Thurston. Asa grew up in Fitchburg, the son of a family of scythe makers who were town pioneers. The man told of Humehume pulling him to school in a sled on a winter’s day, of the Hawaiian youth working in a tannery, probably in his early teens, of his losing his job due to his behavior, and of his likely hiding on a Fitchburg farm prior to going to sea as a Marine in the War of 1812. Here’s the account from the 1885 edition of the Proceedings of the Fitchburg Historical Society. About the year 1812, a boy thirteen or fourteen years of age, by the name of George Prince Tamoree, a native of the Sandwich Islands, was living in Fitch burg. He was the son of King Kaumualii, of the island of Kauai. George, who is called in some histories “Tamoree,” and in some “Kaumualii,” was brought to this country by an American sea captain, to whom he was entrusted by his father, either that he might obtain an education, or because the king’s wife, or more likely one of the king’s wives, was jealous of the boy, and the father wished to remove him from her sphere of influence. At any rate he came, and the captain who had charge of his funds, lost them, and the boy was thrown upon his own resources. Where or how he lived we do no tknow (except that at one time he was a carpenter’s apprentice) until he came to Fitchburg. Here he is known to have been in the family of Rev. Mr. Cutting, a Baptist minister, for a short time. Mr. Alonzo Goodridge remembers that the lad used to draw him to school on a sled, the school house being located a short distance beyond the poor farm, on the Wanoosnoc Hill road. Afterward, Mr. Thomas Litch, who was the father of Charles S. Litch of this city, and of A. K. Litch, who formerly kept a hardware store on Main street, took the young fellow and employed him at his tannery, which was located at the intersection of Pearl and Townsend streets. Being punished by Mr. Litch for some fault, George ran away and never again made his appearance in Fitchburg, although Mr. Goodridge’s grandmother Pearce believed him to be in hiding for some time on their farm. He enlisted in the U. S. navy, was wounded in the engage ment between the Enterprise and the Boxer. He after wards went to the Mediterranean and was in an engage ment with an Algerine vessel. When the vessel returned to Charleston, S. C., some friends got him released from service and sent him to the school for heathen youth, at Cornwall, Conn.
‘Ōpūkahaīa’s home village located thanks to Rev. Henry Boshard Ph. D.
Kahu Henry Boshard and his wife Iris Boshard sit at a regal koa wood table Henry handcrafted in 1968. He rounded the corners of this fine piece of koa wood furniture to resemble a traditional native Hawaiian taro pounding “poi board.” Henry holds a copy of my book, The Providential Life and Times of Henry Obookiah, and Iris holds a copy of In Obedience. 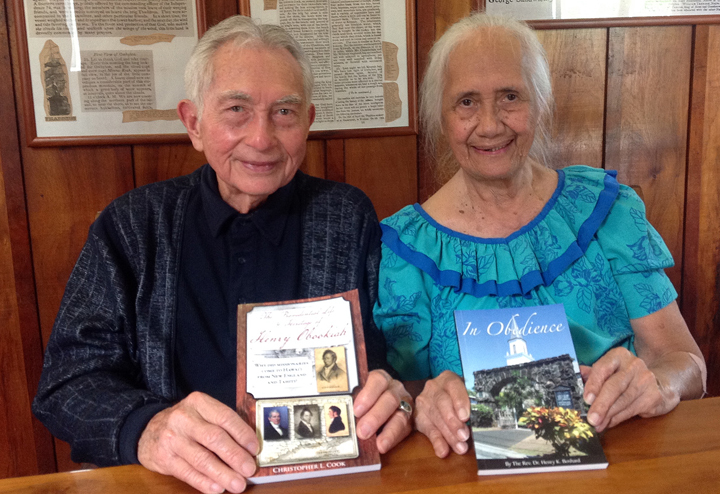 Kahu Boshard’s books are available for sale at the Mokuaikaua Church. The more I uncover historical details from the life of Henry ‘Ōpūkaha‘ia, the more I realize there is much still to be learned. This week I had the pleasure of meeting the Rev. Henry Boshard Ph.D. and his lovely wife Iris Boshard. Kahu Boshard is the former pastor of the Mokuaikaua Church located on the waterfront in Kailua-Kona, Hawai‘i Island. Henry presented me with a copy of his book In Obedience. Kahu Boshard’s book tells the story of his decades of service (1964-retiring in 2006) as pastor of Mokuaikaua and its sister churches along the sunny Kona coast. David Ross, a board member and long-time member at Mokuaikaua, arranged the meeting. I hoped to find out more about the childhood years of ‘Ōpūkaha‘ia along the black sand beach and lava rock coastline at Nīnole and Punalu‘u in the Ka‘ū District of Hawai‘i Island. I had read that Kahu Boshard grew up in Punalu‘u. At our meeting in the Thaddeus Room in the Mokuaikaua sanctuary I learned a lot more than expected. Iris Boshard’s ties to Ka‘ū come through her paniolo father from the Kanaka‘ole family of the Kapapala Ranch. This still-large ranch once stretched from Na‘alehu to Volcano. A vintage photo of the old Hokuloa Church at Punalu‘u, Hawai‘i Island. Photo from The Master and Disciple by Rev. Dr. Henry Boshard. Kahu Boshard’s grandmother Adeline Nihokula Akiu related to her family that the location of a beachfront parcel makai of the Hokuloa Chapel at Punalu‘u is the birthplace and childhood home of ‘Ōpūkaha‘ia. The Hokuloa Chapel, which was dedicated in 1957 in honor of ‘Ōpūkaha‘ia, looks out over the beachfront parcel. Standing at the chapel this week on a one-day ‘Ōpūkaha‘ia tour with Scott Tompkins, long-time Univeristy of the Nations School of Writing instructor, I imagined Henry and his family departing Ka‘ū. Scott and I were there at Kealakekua Bay and at Kahikolu Church in Napo‘opo‘o back in the summer of 1993 when ‘Ōpūkaha‘ia’s remains were returned from Cornwall, Connecticut by his family. Nīnole looking towards Punalu‘u. 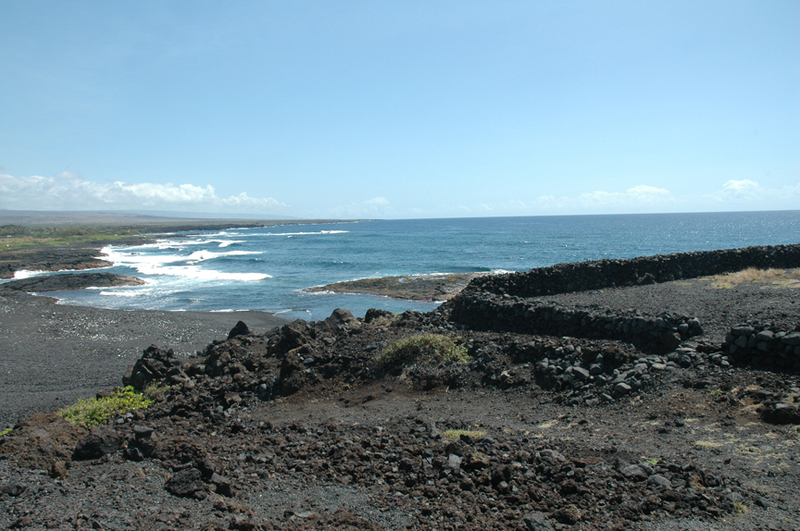 The homesite and birthplace of ‘Ōpūkaha‘ia is located several coves north of this black sand beach. In 1796 ‘Ōpūkaha‘ia’s father served as a minuteman type soldier in a Ka‘ū army marching under orders of the district ali‘i nui. The local chief hoped to reconquer lands taken earlier by Kamehameha, when the king was distracted completing his conquest of O‘ahu. The family’s fate was never to return to their kuleana at Punalu‘u. All except ‘Ōpūkaha‘ia were slaughtered following the Battle of Kaipalaoa near the Waiakea River in Hilo in the summer of 1796. I have hiked to closely look over the coastline about a quarter mile south of the Hokuloa Chapel, a beach known as Koloa in the ahupua‘a of Nīnole. I assumed (a faulty practice in searching for pieces of history) that location was ‘Ōpūkaha‘ia’s home. Now I know better! 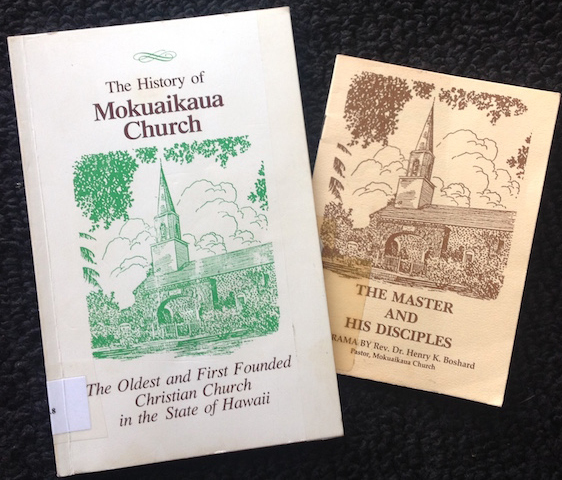 Kahu Boshard is the author of these two publications that are related to the Mokuaikaua Church. The History of the Mokuaikaua Church provides an insightful narrative of the sweep of time that brought native Hawaiians to Hawai‘i over a thousand years ago up to the arrival of the Sandwich Islands Mission in April 1820 and beyond. The Rev. 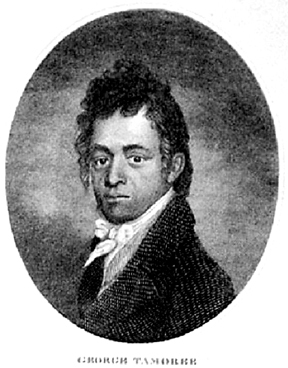 Asa Thurston, co-leader of the first party of the Sandwich Islands Mission, served at Mokuaikaua from the early 1820s up to the years preceding the Civil War. 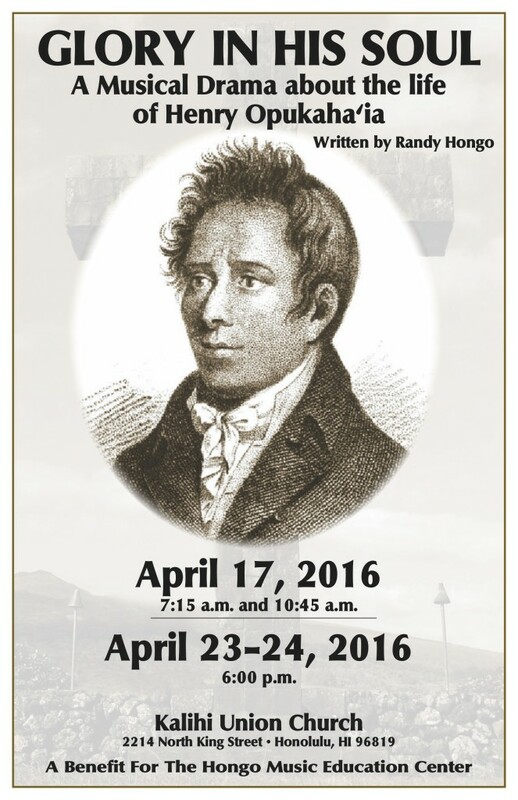 The Master and His Disciples is a drama written and staged by Kahu Boshard for the 165th anniversary of the founding of Mokuaikaua. The drama portrays the story of ‘Ōpūkaha‘ia and his co-adventurer and close friend Thomas Hopu. 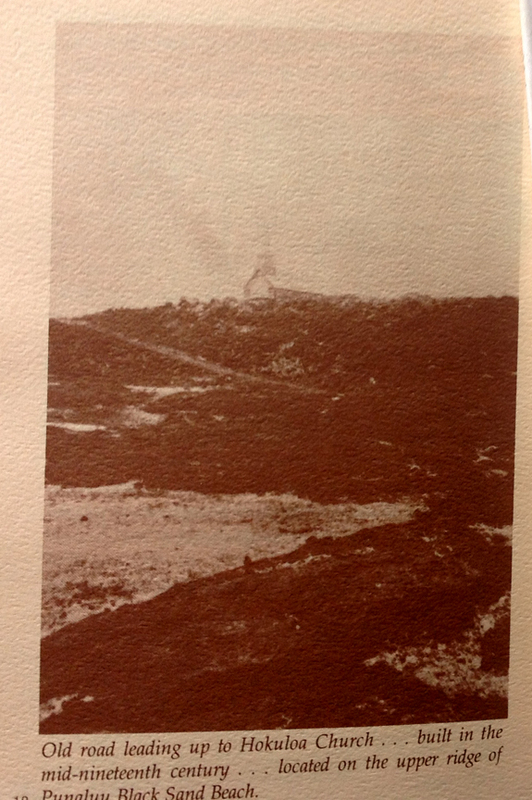 The script for The Master and His Disciples appears in the booklet, along with very interesting historic photos of the old Hokuloa Church at Punalu‘u (which preceded today’s chapel) and a photo of the beach parcel where ‘Ōpūkaha‘ia lived as a child. 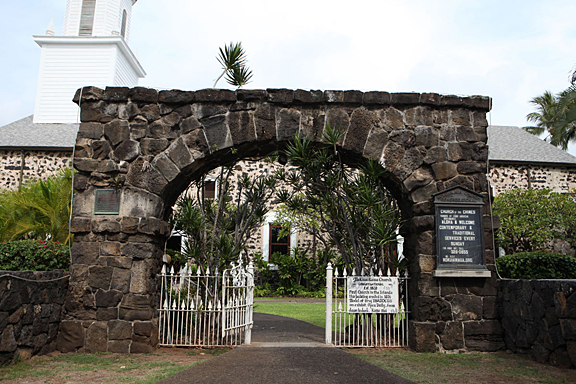 The basalt stone arch entrance to the Mokuaikaua church is dedicated to Henry Opukaha‘ia and was completed in 1910, the year marking the formation of the American Board of Commissioners for Foreign Missions, the Congregational Church organization that sent out the Sandwich Islands Mission to Hawai‘i in 1819. A bronze plaque marking the dedication is visible at the top left side of the archway.